Singapore reefs may be small but they are not insignificant! A weekend visit to the island of Pulau Hantu shows that local reefs are home to some of our planets’ most endangered and vulnerable animals! 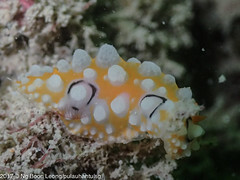 Pulau Hantu is well known for its rare, weird, and wonderful sea slugs! They are a photographers favourite because of the diversity and shapes that they can be found in. 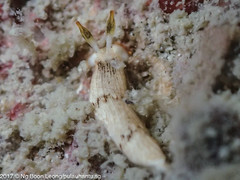 They are also immensely adorable, as our volunteer dive guide, Ng Boon Leong found out. Check out this sap-sucking sea slug. 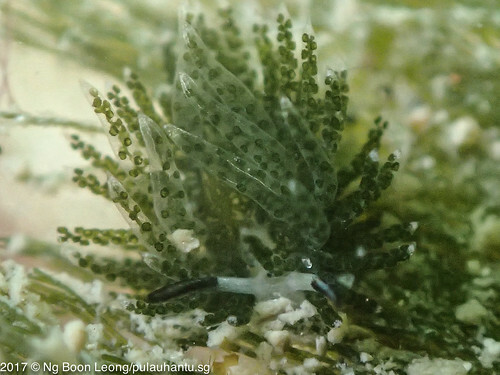 A pair of small black eyes positioned in the middle of its head makes me think its from the Genus Costasiella. Similar to the beloved Strawberry slugs that photographers adore. As their name suggests, these slugs feed on sap! 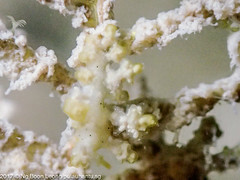 This is sucked out of the many species of macroalgae found on our reefs. These slugs often have a preference for the type of algae they prefer. So not any old algae will do. They also retain chloroplasts in their tissue – that’s all that green stuff we can see in its cerata (the frilly bits on its back). You might recall that chloroplasts are the unique structure found in plants that help with photosynthesis. Corals have them too, thanks to their symbiotic algae. 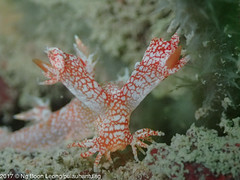 More weird and wonderful sea slugs! Each has their own, unique way of surviving on the reef – a highly competitive landscape where only the toughest creatures can survive and thrive! 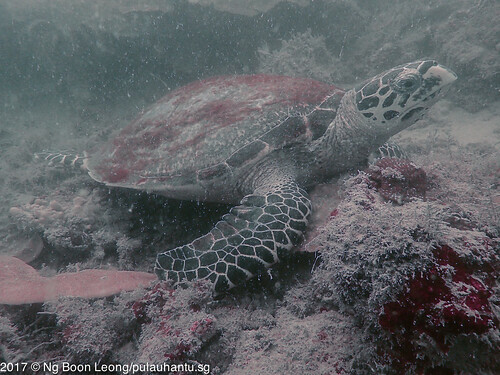 Speaking of a tough life, many divers in Asia may have had the privilege of diving with a sea turtle. So much so that we may forget how truly precious this experience is. 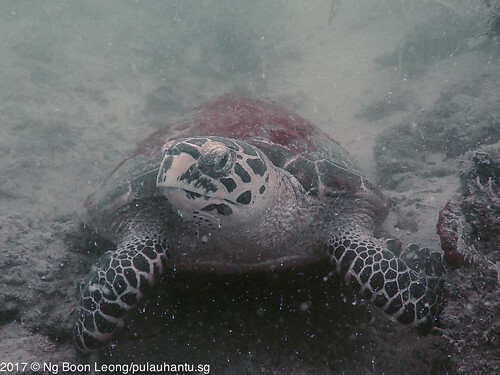 Singapore is home to a Critically Endangered sea turtle, the Hawksbill. This sea turtle has a beautiful carapace (shell)! 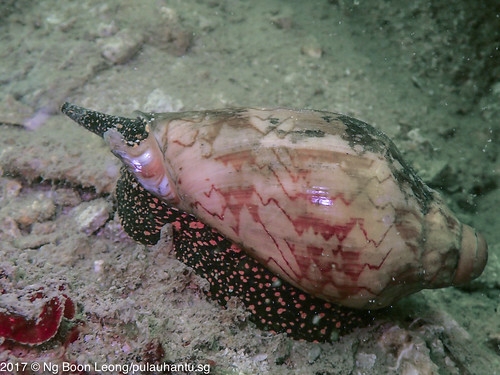 It is for this shell that they are so heavily exploited throughout their range. Even though they have survived for millions of years in the world’s oceans, in just the past 3.5 decades, their global population has declined by 80%! What’s really interesting about the Hawksbill is that they are the only primarily spongivorous reptile – about 85% of its diet is comprised of sponges, and not just any sponge! Only select species of sponges! I wonder which species of sponge are its favourite in Singapore waters? Another really cool thing about the Hawksbill is that they are known to stick to the same foraging area after about 3 years of age (>40cm) – this means that many of the Hawksbills we see here LIVE HERE! And our reefs are important because there isn’t a huge turtle fishery (yes that’s what it’s called – even though they aren’t fish!) in Singapore. Apart from Australia, the poaching of sea turtles throughout the Asia-Pacific region is rife! Our reefs can give the species a good chance of surviving and reproducing (yes! they reproduce here in Singapore too!). Sea turtles are most vulnerable as young adults (~90cm) , even though it may seem that nestlings are the most vulnerable because of their tiny size. Even if we saved every nestling, it does little to save the species, but this is where most efforts are focussed. Perhaps it’s because saving nests and nestlings is most convenient and highly visible since it’s when they are in a huge cluster on the beach. It’s hard to protect sea turtles while they are living out their lives as individuals in the open sea. Young adults are the ones that are harvested for shell and meat, but they are also the most reproductive at this life stage! The turtles in Singapore aren’t going anywhere, they are residents like you and me. And this is their home. That aspect of their life history is something we can capitalise on! We can save our reefs! Another less charismatic but similarly threatened creature is the Noble volute – like the sea turtle, it is heavily harvested for its shell and meat! These two animals couldn’t be more different, but their threats are so similar! This beautiful carnivorous snail feeds on molluscs (e.g. mussels) and echinoderms (e.g. sea stars), and can grow to a whopping 20cm! Traditionally, their shells were used as spatulas for water and commodities (flour, sugar, salt). While the population could tolerate traditional harvesting pressures, its main threat today is loss of habitat as shores are reclaimed, developed, hardened, and dredged. But all is not lost – the more we learn, the better we are able to develop wise and sensitive methods to minimise impact on our coasts. What is really needed is for us to implement these methods. Singapore can become a leader in environmental management if we mandate Environmental Impact Assessments to assess and monitor the social and environmental impact of development projects. Notice the word “social”? Yup! What you think matters! If our reefs, coasts and water quality matter to you, make it known! Write to your MP or the newspaper to make your values known! Let them know you care. Your letters don’t have to be long, they just have to express your concern and value for our natural heritage. Next month, I will be a mentor at the Biodiversity Friends Forum, to share about how we can translate biodiversity awareness into action, and encourage youth involvement in conservation policy and decision-making – because saving our reefs takes lots of hard work. While it begins with nature appreciation and awareness, it requires a long process of working together with a diverse group of stakeholders to implement changes that can have a wide-ranging and long-term effect. Protecting our green spaces and beautiful oceans may begin with our feet in the wilderness, but what matters is to have our bums firmly seated at the tables (metaphorically speaking). If you care – act!